As of July 2014, Apple was the top smartphone original equipment manufacturer, or OEM, with a 41.9 percent share of the market, up from 41.3 percent in the preceding three months. Samsung Electronics Co. Ltd. ranked second with a 27.8 percent market share, while LG Electronics Inc., Motorola and HTC Corp rounded off the top five. We see the iPhone leading in the Smartphone industry but often forget just how significant the model was to the industry as a whole. Five years ago today, Apple’s first iPhone hit stores while many in the tech world thought that it would be a flop because it was ridiculously expensive and it was something no one had ever really heard of before: a smartphone targeted primarily at consumers, rather than business people. Five years later and Apple’s fifth-generation iPhone, the iPhone 4S, is the most popular single gadget on the planet. 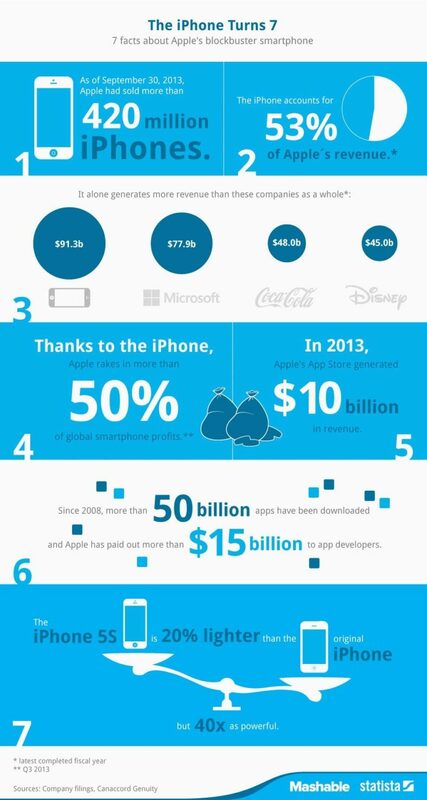 In fact, in five years the iPhone has sold 250 million total iPhones and raked in $150 billion in revenues. While Google’s Android platform has emerged as a strong competitor, the iPhone remains the single most popular smartphone in the world. As we know, in the U.S., the iPhone has been the first or second most popular single handset since the second quarter of 2008. With the introduction of the iPhone 4s in October 2011 and then the iPhone 5 in September of 2012, the company continues to grow and post record profits. I have an iPhone 5s and previously had the iPhone 4s so I am personally familiar with the products and I enjoy their functionality and accessibility. Do you have an iPhone? If not, what do you have?